I haven’t been doing much cooking lately, as much as I think about food you would think I’d do more than heat up bourgeois ramen noodles and adding in chicken. It’s a sad state of affairs, really just sad for Mr. Mockingbird and I, not anyone else. Nonetheless, in these days of little to no cooking, flipping through and reading cookbooks is a vicarious experience. I look at the pictures and dream of making beautiful food. This I do in my free time, but as it is often with Mockingbird, this week I got to do what I do for fun for work for the upcoming Lee Bros event at Knox Public House. It was a lovely experience, I was on the beach and at the pier watching the shrimp and oysters come in; I was in the kitchen peeling garlic and shredding cheese; I was at the market picking out summer fresh tomatoes; I was driving down some country roads searching for the address of the guy selling green peanuts; finally I was on the porch sipping a cocktail. From that mental trip, here is our menu for the eve. We will be serving up a tasting plate with small bites of Henry’s Cheese Spread, Shrimp + Grits, Boiled Peanuts, and Grapefruit Chess Pie. Our cocktails will be the Rock and Rye and the Hugo. 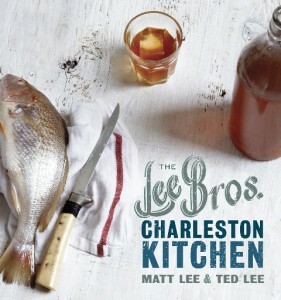 All from Matt Lee and Ted Lee’s new book, The Lee Bros Charleston Kitchen. Please be sure to join us April 3 from 6:30 – 8:30 to meet Matt and Ted, buy their book, taste our execution of their recipes, and chat about the wonders of mental food trips. We’ll all pretend we’re on the porch sipping a Hugo, cracking boiled peanuts. If you can’t make the Public House event they will also be signing at Union Ave books from 5 – 6 the same day. I am beyond excited that the James Beard Award Winning Authors Matt Lee and Ted Lee will be at the Public House on April 3 from 6:30 to 8:30. They will be signing books and guest bartending, serving up a signature cocktail from their latest The Lee Bros. Charleston Kitchen. For me, the Lee Brothers are the torch bearers for modern Southern food. Each of their books has a distinct voice that respects tradition but is not afraid to adapt, interpret, and re-imagine recipes for our modern kitchens. If you’ve had the pimento cheese at the Public House you are already a fan of their recipes. 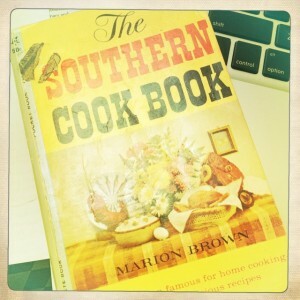 Ours is based on a recipe from their second book, Simple Fresh Southern. I grew up around food writing. My dad was a food writer and penned a few cookbooks in his day. He was writing about Appalachian food well before it was anywhere close to cool in the national eye. As a result we met Matt and Ted, among others, over the years at different food writing events. They started early, stuck with it, and have always stayed true to true Southern. And by true Southern I mean the modern kind that skateboards, calls their grandmas for recipes, and might spend half the year in New York City. I recently reconnected with Matt and Ted at the Cookbook Boot Camp that they led. They reminded me of so many people that were integral to my growing up and formation of my identity through food. While I was working at Appalshop in Whitesburg, KY they came to interview my dad for an article they were writing. I had forgotten, but I took them to Ramey’s Diner. They photographed the cook there, her aged hard working hands and biscuits, I think. Please don’t miss this very special event. No reservations or tickets are required. We will be serving up a plate featuring small portions of a few of their inspired recipes from the new book. Union Ave Books will be at the bar selling the book so you can get a signed copy! If you can’t make the bar event they will also be at Union Ave Books from 5:00 to 6:00. If you have a signed book there you’ll get a discount at the bar, details to come! 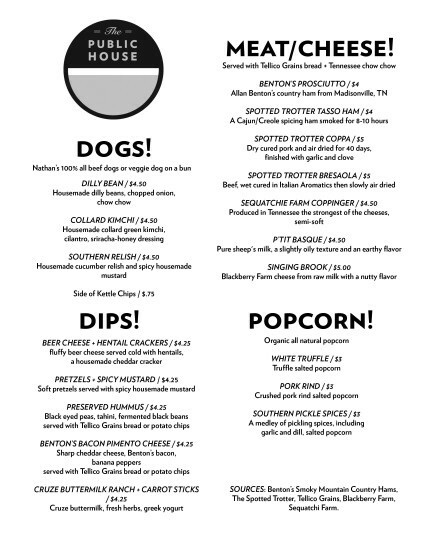 Posted in Uncategorized | Comments Off on Lee Brothers at Knox Public House! New wines start Friday March 23 at the Public House. I am SO excited for this new list. It’s a strong showing for interesting and enjoyable white wines as we welcome this lovely warm weather. The RosÃ© is a great example of French RosÃ©s. It is fruity and light and a steal at the price. I personally bought 5 cases of the Trois Amis Sauvignon Blanc for my wedding. It is interesting and bright and so good. Forget what you think about Chardonnay with the Joseph Drouhin Laforet Chardonnay. Give it a try in a wine flight. You will not be sad. It’s so good and worth every penny. More than any other list I encourage you to pick a few of these for a flight. They all have amazing qualities that really shine when tasted together. Enjoy! Fragrant orange blossom, pear and citrus flavors combine in a ripe, juicy mouthful and provide a surprisingly creamy finish. RosÃ©s are perfect for hot sunny days. Simple, clean, fresh, with light acidity, it’s a fruit-forward wine that’s not simply fruity. There are herbal notes lending freshness to the finish. Portuguese green wine that is the perfect summer drinking wine. Light and effervescent, itâ€™s hard to drink just one glass. Thereâ€™s a slight acidity that balances the citrus flavors. An Italian blend from Umbria. This medium bodied wine has slight mineral qualities that are fresh and harmonious with good body and a finish of citrus fruits. Itâ€™s not a wine we were familiar with before tasting it, but we love it are sure that you will too. This Sauvignon Blanc is a non-traditional wine fill of exotic fruit flavors with a crisp finish. While there are citrus notes they are well balanced to make it the perfect patio wine. A classical unoaked Chardonnay that is fruity and full of life. If youâ€™ve never tried French white wines this is a great start. If youâ€™re familiar with French whites youâ€™ll love it too. With crushed grapes and almond flavors. There is no residual sugar. Torrontes is one of our favorite grapes. It has the mineral flavors of the cold soil the grapes are cultivated in. Itâ€™s great for wine drinkers that donâ€™t want any hint of sugar but still like the crispness of white wines. Weâ€™re in love with the Primal Roots label. Their wines are great for the price and offer a refreshing blend. This white has Viogner, Riesling, Colombard and more. Thereâ€™s a weight to this wine with fruit forward balance. Another great French white. Very light on the palette with a simple and refreshing finish. This is another great introductory French white wine.